The location was in my house in Bethesda, Maryland. After spending years of having the being seated on this couch in my living room and experiencing a truly sinking sensation, I figured it was time to do something about it. 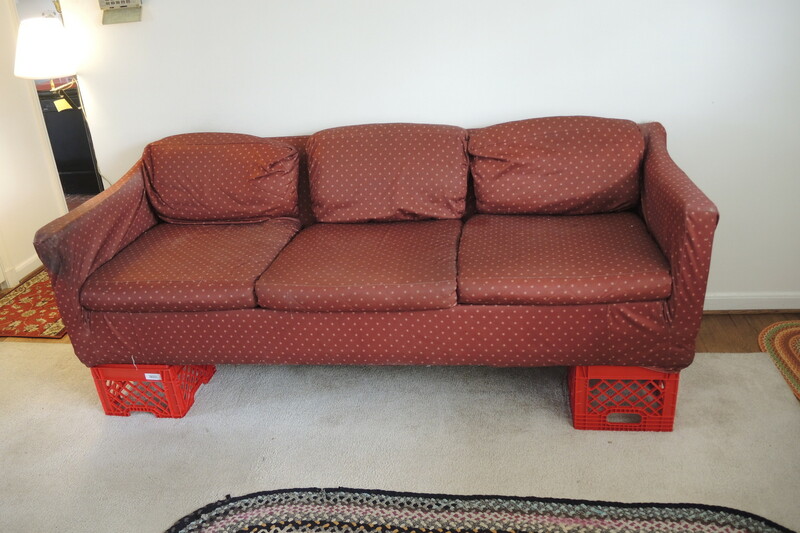 I contemplated many ways to give this couch with a history a boost and finally arrived at the possible solution of using milk crates as they have a reputation for being tough and can often take a great amount of weight. I shopped and found a variety of colors available at the "Container Store" and settled on the color red. I brought the four crates home and proceeded to trim off some of the well defined levels from the top which allowed the structure to continue holding its integrity and thus strength. Having found the right amount to trim off - I placed one under each corner and gained about eight inches of height up off the floor. What a difference ! I can now get up to answer the lan line phone without having it be a double or even triple set of moves of exertion. Not that looking coordinated is that important to me - but it helps - lol. The After Take: I have shown these photos to a few people who have gotten a laugh out of the entire story and further get a kick out of the general appearance of the finished project. In summary: This couch is like a long time friend that has literally been with me through thick and thin and even though it is probably long over due for replacement is going to be with me for a while longer. The trash folks are going to have to wait for a lot longer to find a couch discard in front of my house. I get a big kick out of seeing such couch throw away's and the type of couch design as well as color and sometimes pattern of the upholstery that makes up the personality of the toss. When a couch is at the curb - there is no question that it is there free for the taking. I live in a nice neighborhood - thus some of the couches that have been discarded have been in great shape and gotten rid of because someone got tired of them - not that they were broken nor in a mess. I gave some of them to folks I knew that were in need. I discontinued the practice as everyone got couched up and they are not the easiest things to distribute. And there you have one of my true confessions - lol. Here is hoping all of this brings a smile and perhaps a couch memory. PS: The lower photo shows where the trim cut was to be made to bring the desired height for the couch. It worked ever so well. HAHAHAHAHAHAHA Oh that is hilarious! Glad it worked for you. Clever moved. 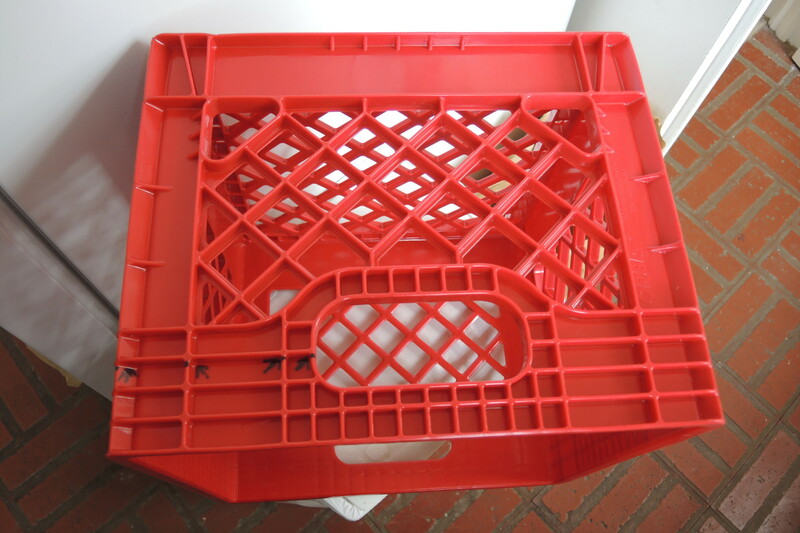 I wouldn't have thought egg crates could support multiple people. You got some room under the couch now for storage too. Ahhh human ingenuity at its finest, good work! I noticed the picture was taken in April. Is it still holding up as of September? What a funny picture. I hope it works! Was this couch a curb couch at one point that you adopted? The cushions and stuff still look to be in great shape. First, I want to thank everyone for their kind comments and complements. To have a laugh at no one's expense is ever so great for the soul. thatoneguy I like your attention to detail. The gap in time from when the pictures were taken and when the story made its way to the site - was a function of my finding the time to put all the pieces together in my mind in the form of a written account. I am happy to report, the arrangement is working just fine. I have not had to adjust anything since the installation. Livin4love. This couch was one I purchased from someone a number of years ago for $ 10 I then proceeded to spend over $ 100 to buy a ready made cover which I found for its odd size at Penny's Somehow the cover has survived my using the couch as my regular seating acomodation virtually every day. Jim: It works like a champ. Yuppie7: I dare not put anything under the couch. I am a big newspaper reader and am constantly tearing out items that interest me or can be passed along to someone that I know is hooked on a subject. So while one cushion is reserved for me to sit on, the rest of the couch is for small stacks of torn our articles. I also save crossword puzzles and send them to recovering veterans - but that is another story which I will put on the site some day as I am refining how I do that. Wow 10 bucks for a couch is a steal!